Launched in 2014 as headline event for the Isle of Wight Walking Festival, this is our NEW long distance trail for the Island, linking all the Carnival Towns and Villages together in a single 100 mile route. It celebrates the Isle of Wight as the birthplace of the English carnival tradition, and promotes the 19 summer carnivals and 6 winter parades which take place on the Island every year. For many carnival towns 2014 also marked the 125 Anniversary of their first parades. Devised by The NCC with Ali Pretty, outdoor artist, and Richard White, digital artist, each leg of the five day walk links iconic places and scenic landscapes in a celebration of our rich and diverse carnival heritage. Over the 2014 May Day bank holiday, members of the public joined in the whole 5 day walk, a single day, or for part of a day, according to their interests, location and fitness levels! A specially commissioned hand-painted silk banner, inspired by collected stories, reminiscence and archive from each local carnival tradition was carried on every leg of the route. 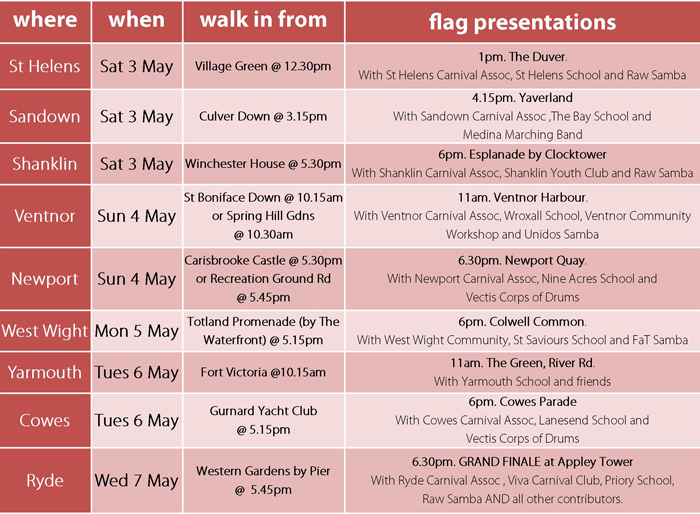 As the trail approached each carnival town, a procession of local schoolchildren, their families and friends came out to meet, greet and lead the walkers home, bearing smaller hand made carnival flags they have made in workshops with local artists. There were also choreographed flag presentations in iconic locations such as Osborne House, Carisbrooke Castle and Tennyson Down. Richard created soundscapes along the way – voices, poems, songs, recorded music and ambient noise to augment the experience. The soundscapes are uploaded to a bespoke Carnival Trail App to be enjoyed by Trail walkers and virtual Trail walkers everywhere, for years to come. Carnival Associations, Groups and Bands from Ryde, Sandown, Shanklin, Ventnor, Cowes, Newport, Yarmouth, Freshwater and Totland, and St Helens Carnivals all took part part. Visit our gallery page for images of the inaugural five day 100 mile walk. The social media platforms below are still open for contributions so please share your experiences here.